The West Australian outback is the kind of serenity meets luxury you’ve been searching for. We’ve put together the best tours, accommodation and sights to see for couples, families and solo travellers alike. Adventure Wild offers small groups quality, affordable, guided camping tours of the spectacular Kimberley region, north-west WA. Professional, experienced guides are married couples working together to bring the Kimberley to life. Learn the history, culture, flora and fauna. Appreciate ancient Aboriginal rock art, walk through impressive natural gorges and swim in crystal clear waterholes on your educational journey. With permanent campsites on 10 out of 11 nights and four two-night stays, its relaxed Kimberley Adventurer itinerary ensures you experience the beauty of this ancient landscape. Kimberley Tours utilise established campgrounds with the best facilities available. The final night is spent at an exclusive campsite on a working cattle station. Put your diet on hold! All meals and snacks are provided; no hidden costs; all-inclusive price; no single supplement; independent travellers are not required to share; guaranteed departures; and personalised service second to none. This is the boutique tour company locally owned and operating exclusively in the Kimberley region. 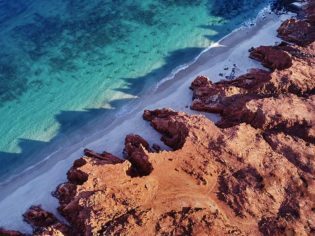 Experience Western Australia’s coastal outback at the Onslow Beach Resort, the gateway to the Mackerel Islands. This absolute beachfront resort offers relaxed, civilised sophistication – a refreshing welcome when travelling through the remote, rugged beauty of the Pilbara region. Located on the mid-coast of WA between Exmouth and Karratha, a two-hour flight or 1400-kilometre drive from Perth, the sparkling new Onslow Beach Resort serves up stylish comfort, fantastic food and spectacular waterfront views along a red-sand beach. Stay in modern self-contained apartments overlooking the pool or ocean. Enjoy a bite to eat or a chilled drink at the stunning Beach Club restaurant and bar. Resort facilities include free wi-fi, Foxtel, an outdoor swimming pool, barbecues, gym, tour desk, Avis car hire and ample parking. Nestled in the heart of Karijini National Park in the remote Pilbara region of WA, Karijini Eco Retreat is a unique and ecologically sound development offering quality, comfortable tented accommodation, cabins, campsites and an al fresco restaurant and bar. Campsites are available for campers and caravans from just $40 per night for two guests with children aged 12 and under free of charge. A short walking trail leads directly from the retreat into Joffre Gorge: stand at the top and you will find yourself overwhelmed by this powerful creation of nature, over 2500 million years in the making.